She Who Must Be Obeyed has never met a foie gras preparation she didn’t like. She’s had it on hot dogs, layered on a tart, served with brioche and apples, and even once as a smoked crème brulée. It wasn’t much of a stretch for me to consider adding a foie gras course to the birthday dinner, but I wanted it to be the dessert, which presented some complications. How would I spin a traditionally savory opening course as a sweet finish? 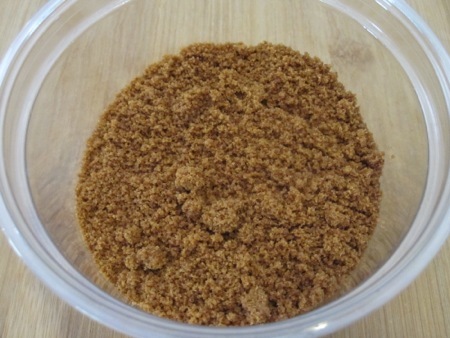 , which has a recipe for foie gras ice cream (which, ironically, can no longer be served in their San Francisco store due to the ridiculous anti-foie regulations that just went into effect in California). The flavor, created in the same spirit of defiance that inspired Hot Doug’s foie dog, is only served in sandwich form between two ginger snap cookies. 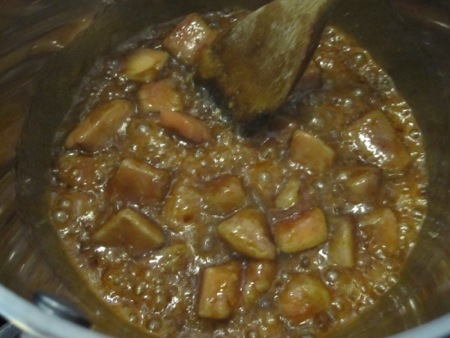 I caramelized sugar, then added small chunks of foie gras, stirring until the fat had rendered out. 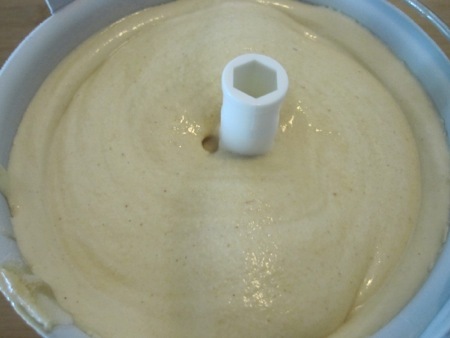 After adding milk, cream, and more sugar, I pureed the mixture in a blender, passed it through a fine strainer, chilled it, and spun it in my ice cream maker. 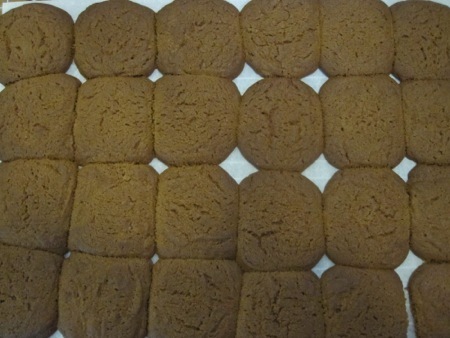 While the ice cream set in the freezer, I baked a batch of ginger snaps. During a routine quality control test on the ice cream a day later, I noticed that it was still a bit soft, probably due to the higher than average fat content. I realized that an ice cream sandwich wouldn’t work – the filling would squish out from the sides. Since whole cookies were no longer a possibility, I ground half of them into crumbs. A bit of thinking about fruit/acid pairings with the ice cream led me to the final plating: place a scoop of ice cream over some of the crumbs, add a sliced strawberry drizzled with balsamic reduction, and garnish with freshly ground pepper and another dot of the reduction. It was a perfectly balanced dish. 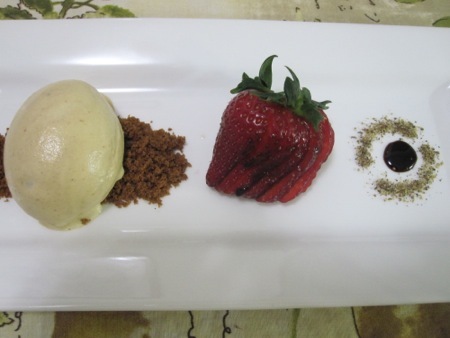 The strawberry/balsamic/pepper combination is a classic presentation with just enough bit to cut through the fatty sweetness of the ice cream. 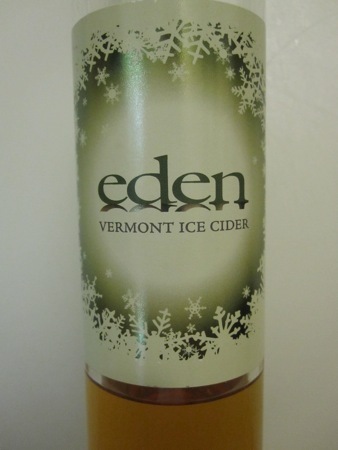 And in a nod to tradition, I served Eden Ice Cider as an accompaniment. I had managed to keep She Who in the dark about the final form of the dessert, which made it all the more gratifying when she finally tried it herself. And if that didn’t make me the Best Husband Ever, I still have another pint of the ice cream waiting in the freezer. This entry was posted in food & cooking and tagged cooking, food, ice cream. Bookmark the permalink.